Welcome to March! Awesome!! How was your February? Where in your life were you being bold? Remember being bold is a choice. This month let’s dive in to who you are, and how you are celebrating being yourself! However that looks like to you! 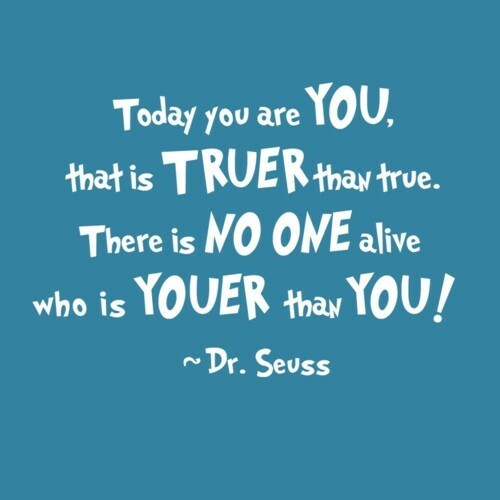 I love Dr. Seuss, his witty messages and wisdom is always amazing. And he’e right, there is no one alive who is youer than you! Who you are is unique. No one can take that away from you. This month we will discover how you can be MORE you! I can remember a fellow woman in business say to me a few years ago now “Aime, would you be more YOU please.” I took a little bit to think on this, and digest it. What did she mean to be more me? I thought I was being me in the first place. Being you is also about slowing down, and figuring out what makes you happy, what you like and love to do. My parents gave me a plaque a number of years ago now that says “Let what you do be what you love.” Are you? To come along on the journey and helping your daughter to finding about being herself click HERE for teens, and HERE for tweens. We can help YOUR daughter!